At the League of Education Voters (LEV), we recognize all of the hard work that you do toward improving public education across Washington state. 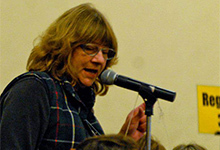 We are pleased to announce our Activist of the Month for January: Sharon Taubel. Read more about Sharon’s work advocating for public education—especially when it comes to equity in education. Sharon Taubel began volunteering in her daughter’s elementary school PTA years ago, and her volunteerism and advocacy continued from there. Sharon is pretty straightforward about why she advocates for others: “I was not well-served by the education system.” But more than that, when Sharon observes what is simply “not right,” she can’t help but do something about it. Sharon attended an Office of the Educational Ombuds’ Finding Your Voice training, co-hosted by LEV, a few years ago, and she says it was transformative. As she became more involved in advocacy and learned more about how the system works through various organizations, Sharon says she began seeing the barriers caused by inequity, or the “-isms,” as she sometimes calls it. By that, Sharon means the inequity caused by systemic racism, by classism, by sexism, and so on. Advocating on so many fronts and “a lot of listening” allowed Sharon to connect the dots between all of these issues that result in an inequitable system, and she believes that bias—conscious or not—stems from people who don’t put the time and effort into connecting all of those dots. “For example, what it means to not have a computer,” Sharon says. She describes her daughter receiving school assignments that must be completed on the computer and that are due the next day. That might sound straightforward—unless you’re a student without easy access to a computer. State Field Director Kelly Munn says that Sharon “raises a voice that often doesn’t get heard.” Kelly also says that Sharon “always pitches in.” Kelly gives the example of a recent PTA meeting, when Sharon volunteered to help parents park in a crowded lot—in the freezing rain. After standing outside in the cold and wet for hours, Sharon finally was able to go inside, and she received a standing ovation for doing what few others were willing to consider. “That’s how committed Sharon is,” Kelly says. In addition to parking duty, Sharon worked on the simple majority campaign in 2010, fighting to defeat Tim Eyman’s I-1053. She also collected signatures for the public charter schools initiative in 2012, I-1240.